Do you want this summer to be worthwhile for your kids? Let them participate in this year’s Summer Program at the Mind Museum. They offer interesting programs for your kids to enjoy. The program is already over and a lot of kids enjoyed the forensics science workshop. It’s not too late though, there are other programs lined up for your kids to participate. Let your kids learn about the science behind survival. 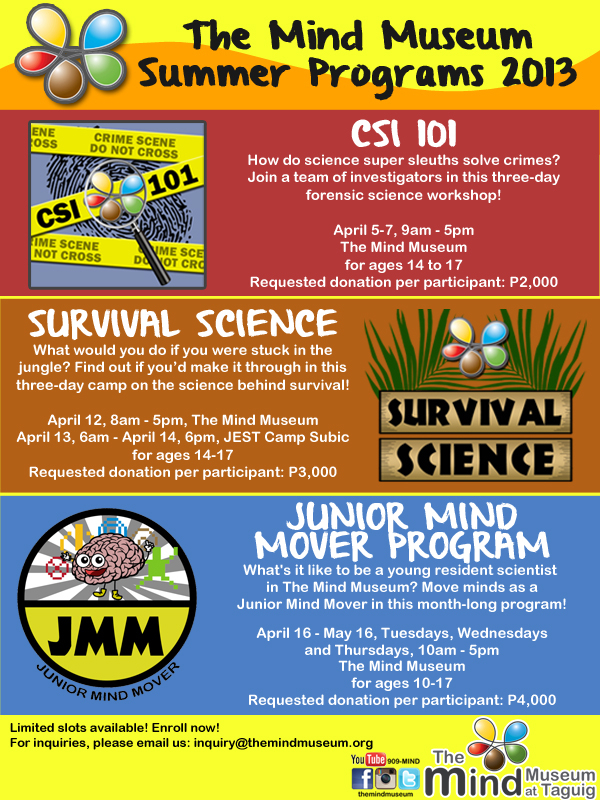 This program will be held on May 17, 2013 at 8AM to 5PM at the Mind Museum. 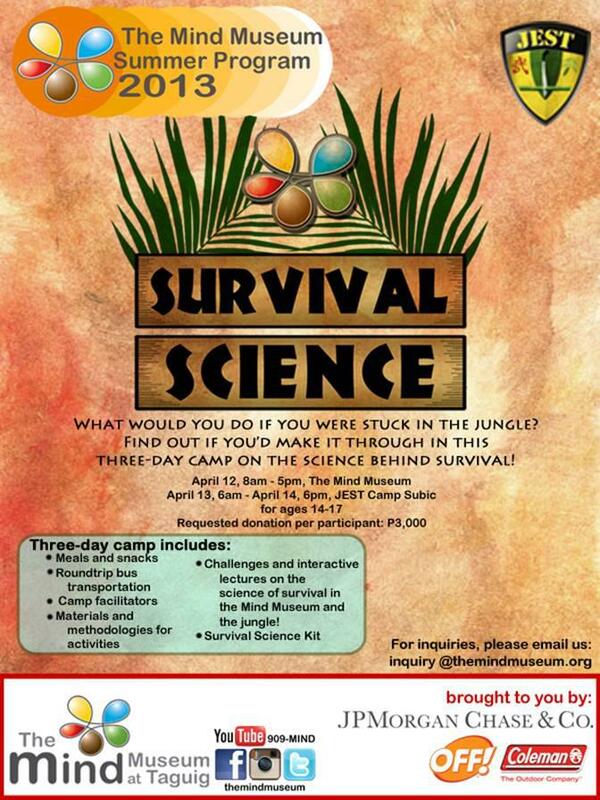 The second and third day (May 18-19, 2013) will be held at JEST Camp in Subic. The activity will start at 6AM and will end at 6PM. Donation requested for this program is PhP3,000. *Date has been moved to May 17-19, 2013 and is now open for all ages. Do want your kids to experience what’s it like to be a young resident scientist in the Mind Museum? 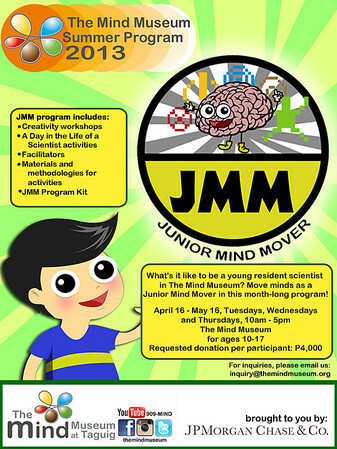 It’s easy and affordable, join the Junior Mind Mover program and let your kids get a feel of the ins and outs of the Mind Museum for a month. The program runs from April 16 to May 16, 2013 during Tuesdays, Wednesdays and Thursdays at 10AM to 5PM. This is for ages 10-17 years old and donation needed is PhP4,000. Get a chance to win 6 complimentary tickets to the mind museum this summer. The promo has been extended until April 30, 2013. What are you waiting for? Contact the Mind Museum now for more information at inquiry@themindmuseum.org or visit their website at www.themindmuseum.org. The Mind Museum is the 1st non-profit, non-stock, private World-Class Science Museum in the Philippines. It aims to provide an extraordinary educational experience and inspires the public understanding of Science. It is located at JY Campos Park, 3rd Avenue, Bonifacio Global City, Taguig.